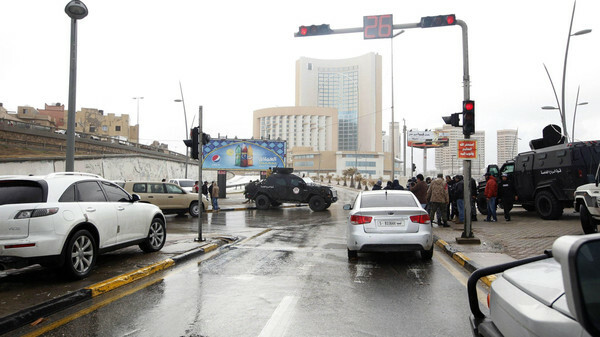 Security forces surround Corinthia hotel after a car bomb in Tripoli Jan. 27, 2015. Gunmen who stormed a luxury hotel in Tripoli on Tuesday blew themselves up after killing three security guards, Al Arabiya News Channel reported, quoting security sources. The gunmen had been chased and held up in the 21st floor of the hotel before they detonated their explosive belts, according to security sources. Local television reported that the prime minister of Tripoli’s rival government and three foreign nationals had been evacuated from the hotel that is often used by senior officials and overseas delegations. “The security forces are evacuating the guests floor by floor. There was shooting between the gunmen and the security forces,” Essam Naas, a spokesman for Tripoli security forces, told Reuters. The gunmen detonated a car bomb outside the Corinthia Hotel, killing the three guards. At least three attackers entered the hotel. Libya is caught up in a conflict between two rival governments – an internationally recognized one based in eastern Libya and a rival administration set up in Tripoli after an armed faction called Libya Dawn took over the capital. Most foreign governments closed their embassies and pulled their staff out of Tripoli after fighting erupted last summer. But some business and trade delegations still visit the capital. It was not immediately clear who carried out Tuesday’s attack, but the SITE monitoring service said a militant group claiming affiliation with Islamic State had claimed responsibility. Citing social media, SITE said the group said the attack was revenge for the death of Abu Anas al-Liby, a suspected al Qaeda member accused of helping plan the 1998 bombings of the U.S. embassies in Tanzania and Kenya. He died in hospital this month in New York ahead of his scheduled trial.